The Cafe is open weekends where you can get a large or small breakfast, a variety of sandwiches, and hot and cold drinks. The fishery pellets are available from the counter at £1.50 for 1.5 pints. There is also a fisherman’s toilet on the house, with hot and cold running water. There is accommodation for up to 9 people. 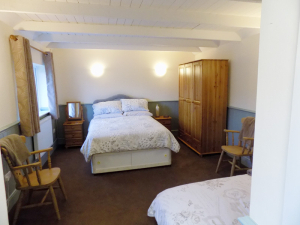 The Old Dairy has a double bed and a z bed, a small kitchenette, en suite, and flat screen tv with freeveiw, and free wifi at £35 per person per night, ideal for a family with a child (no pets). The Old Milking House has two single rooms, and a twin room. It boasts a modern wet room and all are tastefully decorated, these rooms are £30 per person per night. 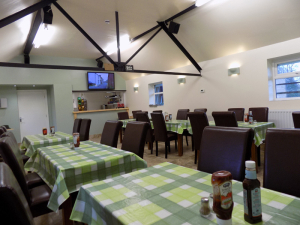 All of the on site accommodation comes with a superb full English breakfast in with the price, and all prices drop £5 per person per night if you choose to stay the week with us. 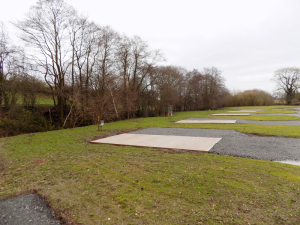 We now have 5 concrete pads with hard standings for touring caravans. For members of the Camping & Caravanning Club only. Prices are £16 per night inc electric. The site has a chemical disposal point, water points, and the electric points. Dogs and children allowed, but please respect that the site is primarily a fishery and a peaceful environment is part of that. Visitors are kindly reminded that if they are taking their furry friend for a early morning/evening walk that do not go near the electric fences outside of fishery hours. THE FISHERY WILL NOT BE HELD RESPONSIBLE FOR INJURY OR DAMAGE TO YOU,YOUR PET, OR YOUR POSSESSIONS. Dog owners are to clear ALL fowling from their pets.